We all love to shop online for different things, and we love the ability to pay payments online as well. However, what we can all do without are the hackers and the identity thieves that are constantly trying to steal your information when you’re shopping online. They can grab your bank account or credit card information easily when you are shopping or paying bills online and then they can drain your wallet. So how do you shop or pay bills online without having to worry? With Paysafecard, you can easily prepay as much as you need to and then have fun shopping or easily pay bills online without having to worry about who can get your information. Since Paysafecard is a prepaid card, you can safely use it anywhere online you wish, and no one can get to any of your personal information. Paysafecard is excellent for those that want to shop online, pay their bills, send money to other countries, and so much more. 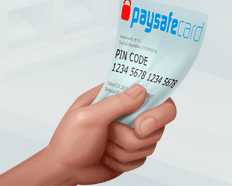 You never have to worry about anyone getting your information or selling it – as Paysafecard is completely safe. When you use your Paysafecard on sites that offer a secure online payment method, it also helps to keep your name, address, and other shipping information safe as well. So why is Paysafecard so safe? Simple, because you are buying a prepaid card at a physical location – not online. So no one can get your information when you’re purchasing one. Then, when it’s used online for shopping or payments, it is simply a PIN that you enter in instead of your personal bank information, credit card number, or even PayPal information. No one has access to any of your information at any time, so there is no chance of it falling into the wrong hands. And if you do happen to order something from a site that isn’t secure, you can rest assured that your personal information is not going to be out there for sale to anyone that wants to buy it. It helps to keep you and your information completely safe from prying eyes.